The Flow Study at the end of the book has lots of possibilities. 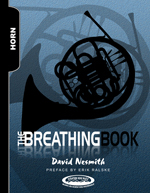 Play around with transposing it in all keys, up and down, throughout the full range of the horn. Enjoy a different transposition each day!